Ms. Emilie Pingel, the advisor of the Math Club, welcomes any student to join. Math Club was established in the 1970s, and it has been growing ever since. Ms. Pingel has been the advisor since 2015, and helps with providing students with an environment for them to challenge each other while they work on a common topic of math. The club also offers students the option to compete with their love and talent of math by allowing the students to be able to go to the regional tournament three times a year at UW- Stevens Point. This club helps with the love of math, but it also allows students to be a part of something. 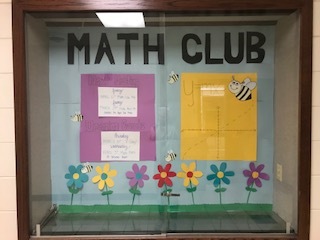 Math Club is a place for students to become involved in school activities. It also allows them to pursue something that interests the students outside of the classes they take.